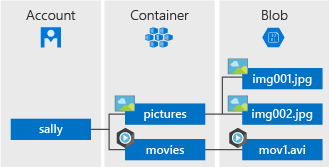 Azure Blob 存储是 Microsoft 提供的适用于云的对象存储解决方案。Azure Blob storage is Microsoft's object storage solution for the cloud. Blob 存储最适合存储巨量的非结构化数据。Blob storage is optimized for storing massive amounts of unstructured data. 非结构化数据是不遵循特定数据模型或定义（如文本或二进制数据）的数据。Unstructured data is data that does not adhere to a particular data model or definition, such as text or binary data. 直接向浏览器提供图像或文档。Serving images or documents directly to a browser. 存储文件以供分布式访问。Storing files for distributed access. 存储用于备份和还原、灾难恢复及存档的数据。Storing data for backup and restore, disaster recovery, and archiving. 存储数据以供本地或 Azure 托管服务执行分析。Storing data for analysis by an on-premises or Azure-hosted service. 用户或客户端应用程序通过 HTTP/HTTPS 可以从世界任何地方访问 Blob 存储中的对象。Users or client applications can access objects in Blob storage via HTTP/HTTPS, from anywhere in the world. Blob 存储中的对象可以通过 Azure 存储 REST API、Azure PowerShell、Azure CLI 或 Azure 存储客户端库访问。Objects in Blob storage are accessible via the Azure Storage REST API, Azure PowerShell, Azure CLI, or an Azure Storage client library. 客户端库适用于各种语言，包括 .NET、Java、Node.js、Python、Go、PHP 和 Ruby。Client libraries are available for a variety of languages, including .NET, Java, Node.js, Python, Go, PHP, and Ruby. Blob 存储支持 Azure Data Lake storage Gen2，即 Microsoft 适用于云的企业大数据分析解决方案。Blob storage supports Azure Data Lake Storage Gen2, Microsoft's enterprise big data analytics solution for the cloud. Azure Data Lake Storage Gen2 提供分层文件系统，具有 Blob 存储的优势，包括低成本的分层存储、高可用性、强一致性以及灾难恢复能力。Azure Data Lake Storage Gen2 offers a hierarchical file system as well as the advantages of Blob storage, including low-cost, tiered storage; high availability; strong consistency; and disaster recovery capabilities. 有关 Data Lake Storage Gen2 的详细信息，请参阅 Azure Data Lake Storage Gen2 简介。For more information about Data Lake Storage Gen2, see Introduction to Azure Data Lake Storage Gen2. 以下图示显示了这些资源之间的关系。The following diagram shows the relationship between these resources. 存储帐户在 Azure 中为数据提供唯一的命名空间。A storage account provides a unique namespace in Azure for your data. 在 Azure 存储中存储的每个对象都具有一个包含唯一帐户名称的地址。Every object that you store in Azure Storage has an address that includes your unique account name. 帐户名称与 Azure 存储 blob 终结点的组合构成了存储帐户中对象的基址。The combination of the account name and the Azure Storage blob endpoint forms the base address for the objects in your storage account. 若要创建存储帐户，请参阅创建存储帐户。To create a storage account, see Create a storage account. 若要了解存储帐户的详细信息，请参阅 Azure 存储帐户概述。To learn more about storage accounts, see Azure storage account overview. 容器对一组 blob 进行组织，类似于文件系统中的目录。A container organizes a set of blobs, similar to a directory in a file system. 一个存储帐户可以包含无限数量的容器，一个容器可以存储无限数量的 Blob。A storage account can include an unlimited number of containers, and a container can store an unlimited number of blobs. 容器名称必须小写。The container name must be lowercase. 有关命名容器的详细信息，请参阅命名和引用容器、Blob 和元数据。For more information about naming containers, see Naming and Referencing Containers, Blobs, and Metadata. 块 Blob 存储文本和二进制数据，最多约为 4.7 TB。Block blobs store text and binary data, up to about 4.7 TB. 块 Blob 由可以分别管理的数据块构成。Block blobs are made up of blocks of data that can be managed individually. 与块 Blob 一样，追加 Blob 也由块构成，但针对追加操作进行了优化。Append blobs are made up of blocks like block blobs, but are optimized for append operations. 追加 Blob 非常适用于诸如记录来自虚拟机的数据之类的场景。Append blobs are ideal for scenarios such as logging data from virtual machines. 有关不同类型 Blob 的详细信息，请参阅 Understanding Block Blobs, Append Blobs, and Page Blobs（了解块 Blob、追加 Blob 和页 Blob）。For more information about the different types of blobs, see Understanding Block Blobs, Append Blobs, and Page Blobs. AzCopy 是一种易于使用的适用于 Windows 和 Linux 的命令行工具，可以跨容器或跨存储帐户将数据复制到 Blob 存储，以及从 Blob 存储复制数据。AzCopy is an easy-to-use command-line tool for Windows and Linux that copies data to and from Blob storage, across containers, or across storage accounts. 有关 AzCopy 的详细信息，请参阅使用 AzCopy v10（预览版）传输数据。For more information about AzCopy, see Transfer data with the AzCopy v10 (Preview). Azure 存储数据移动库是一个 .NET 库，用于在 Azure 存储服务之间移动数据。The Azure Storage Data Movement library is a .NET library for moving data between Azure Storage services. AzCopy 实用程序是使用数据移动库生成的。The AzCopy utility is built with the Data Movement library. 有关详细信息，请参阅数据移动库的参考文档。For more information, see the reference documentation for the Data Movement library. Azure 数据工厂支持使用 Azure 资源身份验证的帐户密钥、共享访问签名、服务主体或托管标识向/从 Blob 存储复制数据。Azure Data Factory supports copying data to and from Blob storage by using the account key, shared access signature, service principal, or managed identities for Azure resources authentications. 有关详细信息，请参阅使用 Azure 数据工厂向/从 Azure Blob 存储复制数据。For more information, see Copy data to or from Azure Blob storage by using Azure Data Factory. Blobfuse 是 Azure Blob 存储的虚拟文件系统驱动程序。Blobfuse is a virtual file system driver for Azure Blob storage. 可以使用 Blobfuse 通过 Linux 文件系统访问存储帐户中的现有块 Blob 数据。You can use blobfuse to access your existing block blob data in your Storage account through the Linux file system. 有关详细信息，请参阅如何使用 Blobfuse 将 Blob 存储装载为文件系统。For more information, see How to mount Blob storage as a file system with blobfuse. Azure Data Box Disk 是一项服务，如果大型数据集或网络限制导致通过网络上传数据不可行，此服务可将本地数据传输到 Blob 存储。Azure Data Box Disk is a service for transferring on-premises data to Blob storage when large datasets or network constraints make uploading data over the wire unrealistic. 可以使用 Azure Data Box Disk 从 Microsoft 请求固态磁盘 (SSD)。You can use Azure Data Box Disk to request solid-state disks (SSDs) from Microsoft. 然后，你可以将数据复制到这些磁盘中，将磁盘寄回 Microsoft，我们就会将数据上传到 Blob 存储中。You can then copy your data to those disks and ship them back to Microsoft to be uploaded into Blob storage. Azure 导入/导出服务提供了一种方法，可将大量数据从存储帐户导出到你提供的硬盘，然后 Microsoft 会将数据寄回给你。The Azure Import/Export service provides a way to export large amounts of data from your storage account to hard drives that you provide and that Microsoft then ships back to you with your data. 有关详细信息，请参阅使用 Microsoft Azure 导入/导出服务将数据传输到 Blob 存储中。For more information, see Use the Microsoft Azure Import/Export service to transfer data to Blob storage.